The "tourist road over Folgefonna" has amused tourists for hundreds of years. From the summit of the glacier you can see the Hardangervidda plateau in the east, the North Sea in the west and if you look south you can see the rugged mountains of the astonishing Rosendal Alps. During the entire 18 th century and until the beginning of the First World War, people from all over Europe were transported by horseback to the edge of the glacier whereas the transport across the glacier was done on sledges. In the mean time their luxury Yachts sailed around the Peninsula to welcome them at the opposite side of the glacier. Today there is a road tunnel beneath the glacier which makes the return much easier either by bus or by taxi (20 min). For online booking you need to be six persons or more in the group, if you are a less than six please send us an inquire booking. This trip has amused tourists for hundreds of years. 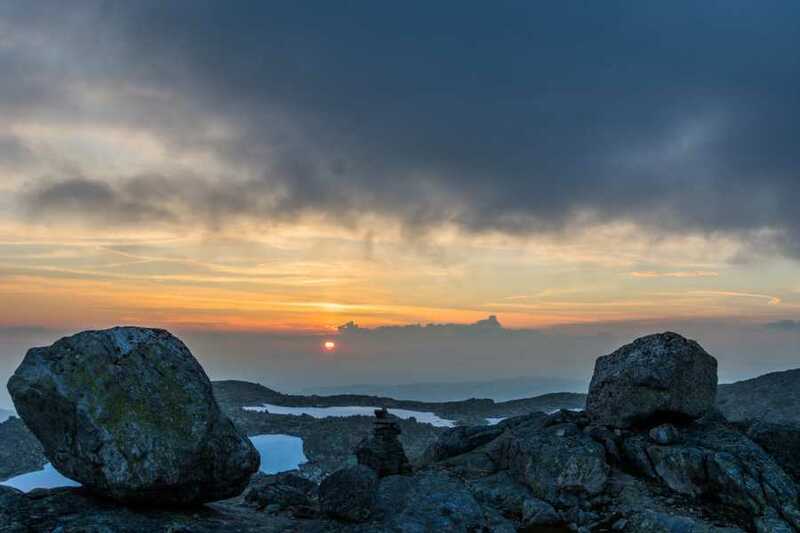 From the summit of the glacier, you can see the Hardangervidda plateau in the east and the North Sea in the west to the south; you can see the rugged mountains of the astonishing Rosendal Alps. During the entire 18 century and until the beginning of the First World War, people from all over Europe carried by horseback from the fjord to the edge of the glacier whereas the transport across the glacier was done on horse sledges. In the mean time their luxury Yachts sailed around the Peninsula to welcome them at the opposite side of the glacier. Today there is a road tunnel beneath the glacier that makes the return much easier either by bus or by taxi (20 min). This is normally a two-day trip, where you walk on your own along T-marked path from Sundal to the DNT cabin Fonnabu. Stay a night over at Fonnabu and next day follow our glacier guide over to the east side of the glacier where the DNT cabin Holmaskjer is situated. As long as weather conditions are fine you will hike on your own down to Odda and can catch a public bus back to Sundal. If weather or snow conditions are not good, we will guide you all the way down to Odda. It is also possible to walk this hike opposite way, means from Odda-Sundal. 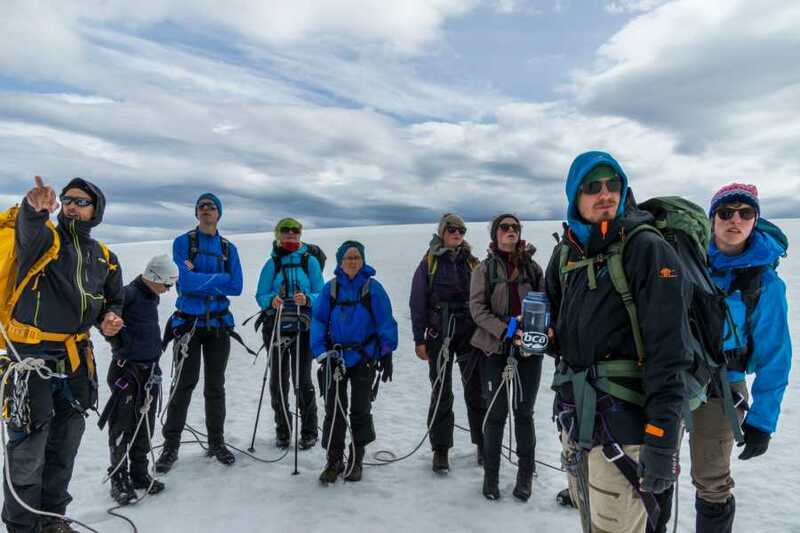 Crossing the glacier demands experience and glacier equipment. Roped together, with the glacier guide in front; the trip across the glacier takes approximately 3 hours and will be on snow and/or blue ice, depending on snow conditions. 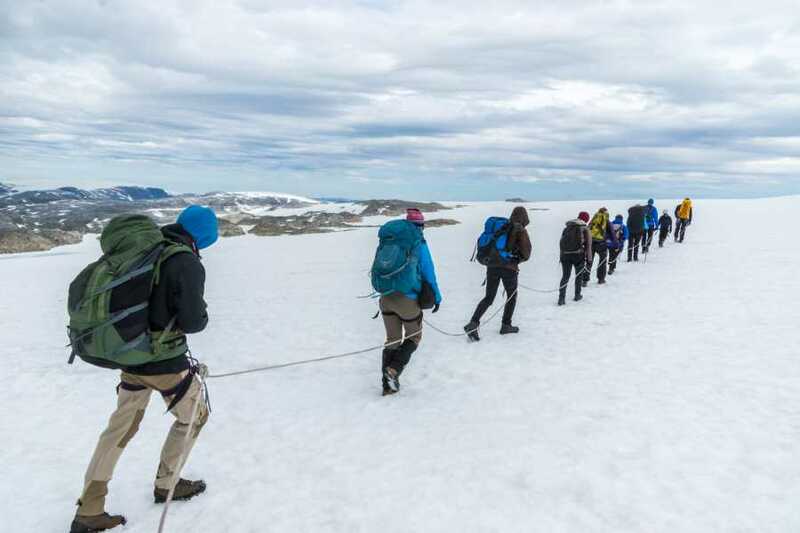 The glacier crossing is not difficult, and is the easiest part of the trip between Sundal-Odda. 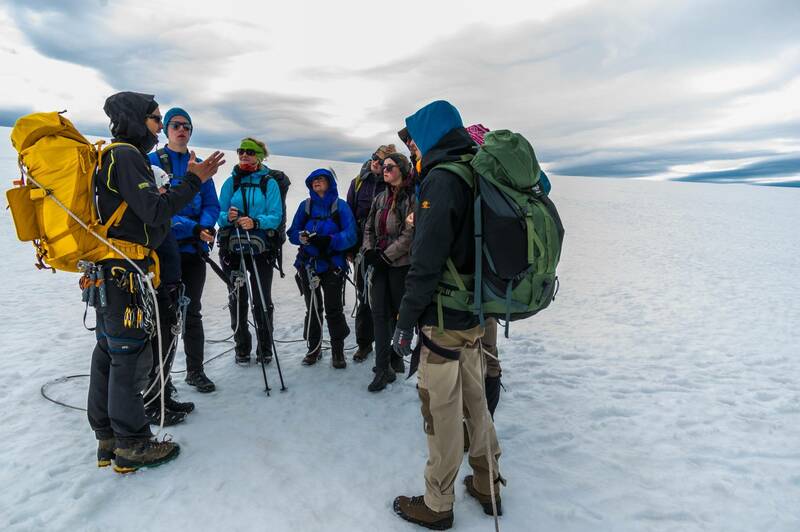 There is no age limit on this trip; if children manage to walk up to one of the DNT cabins, they will also manage the glacier crossing. Approaching the glacier from west you start hiking from Sundal (Mauranger near Rosendal) and follow the track named "Keiserstien" which was built over hundred years ago by local people in Mauranger with some financial support from a German tourist organization. 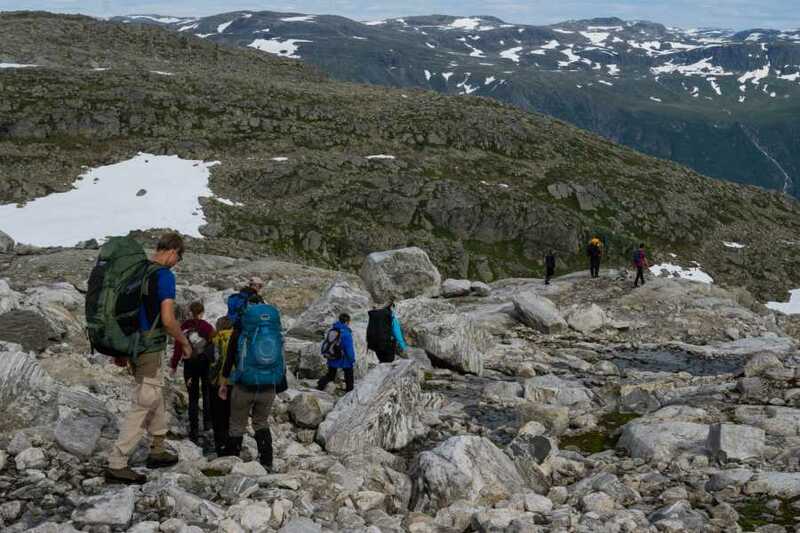 Taking the steep track up the northern side of the Bondhus valley, you can enjoy the magnificent view towards Bondhus glacier, an outlet glacier from Folgefonna. 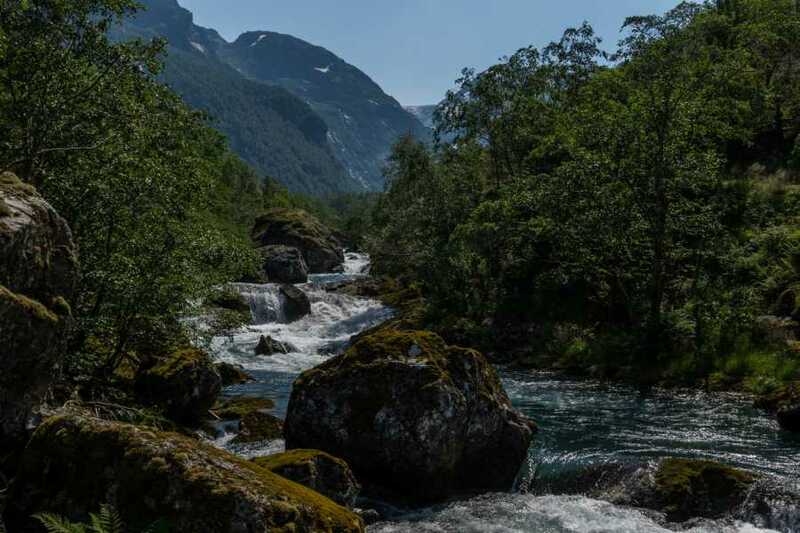 After six to seven hours under your own steam you arrive Fonnabu at the edge of Folgefonna. 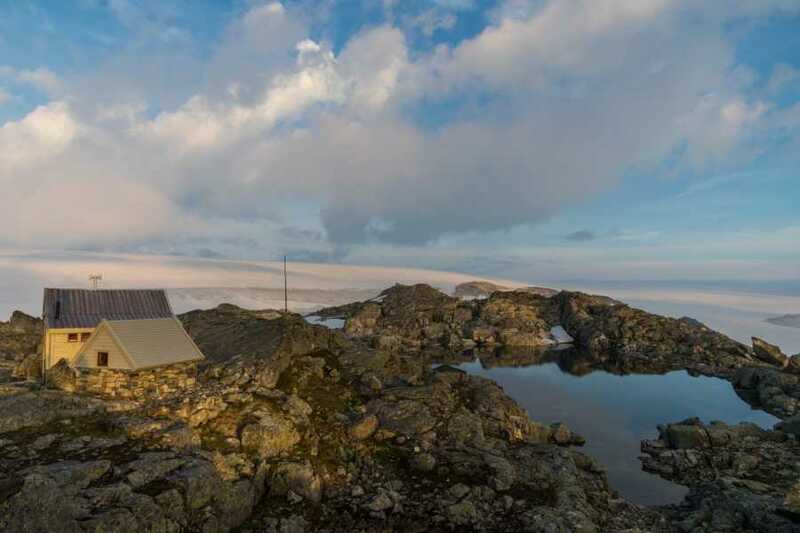 At the east side of the glacier, from Holmaskjer, the ancient tourist track is restored with several resting cabins along its path. 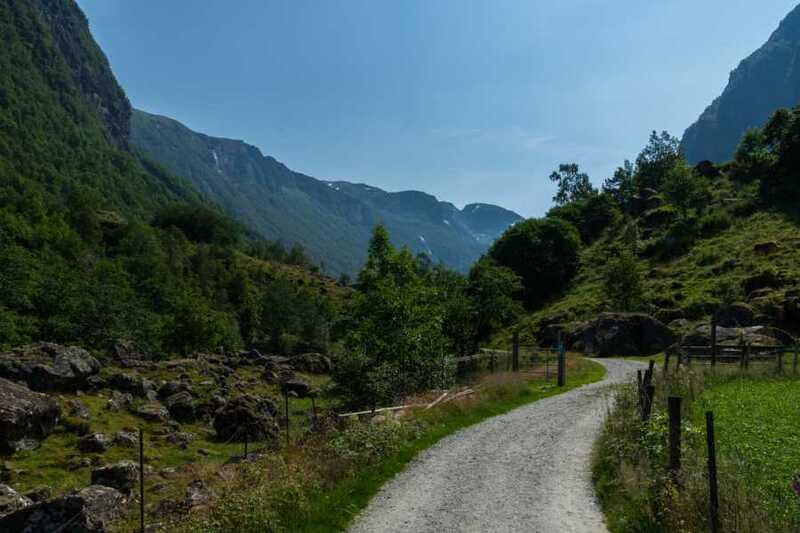 The path is steep down the green valley side to the South fjord by Tokheim (near Odda), and the trip takes from four to five hours. It is therefore recommended that you stay one night in one of the cabins, which is equipped with food storage and 20-30 beds. No reservation of cabin in advance is necessary (for groups less than 8 persons). We need at least 6 participants to arrange this trip (or payment for 6 persons). 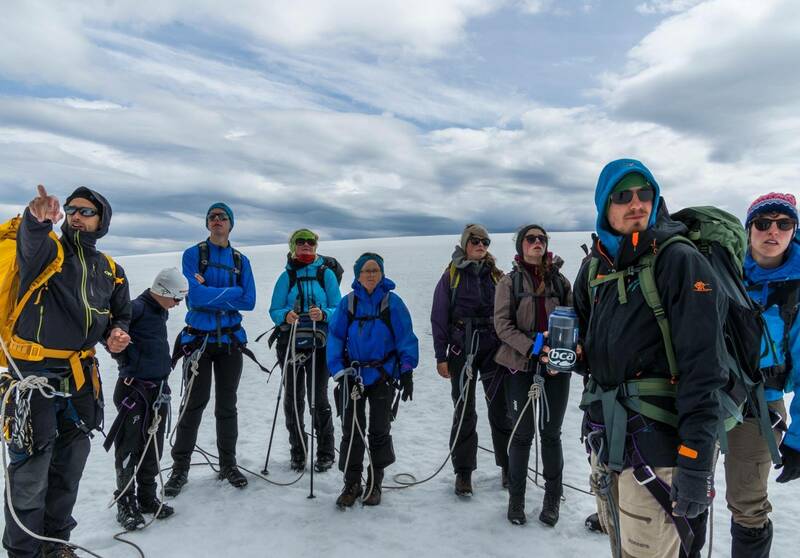 All necessary glacier equipment are included in price. You need to bring warm, wind-and waterproof clothing (weather dependent), gloves, mountain boots, food and something to drink. Sunglasses and sun lotion is recommended. Even if paths/horse roads on both sides of glacier is T-marked the weather can change quickly, and snow can hide the path and T-marks, because of this it’s strongly recommend to bring map 1:50 000 and compass (maybe also GPS). We prefer online booking, but also possible by phone (47 95117792), e-mail or at our booking center in Juklafjord (Jondal). For online booking you need to be six persons or more in the group, if you are a less than six persons please send us an inquire booking.